‘Nepal Snubs India’ Headlines Don’t Reflect Diplomatic Reality - Integration Through Media ....! Nepal’s government headed by K P Sharma Oli has ordered its military to withdraw from the first-ever joint military exercise by the BIMSTEC countries. The exercise was initiated by India during the fourth BIMSTEC summit held in Kathmandu only last month. This last-minute decision by PM Oli to pull out of the drill, which is being held in Pune, has more than upset the Narendra Modi government. It appears to signify that Nepal is not completely on board with India’s efforts to promote defense and security cooperation with BIMSTEC nations. 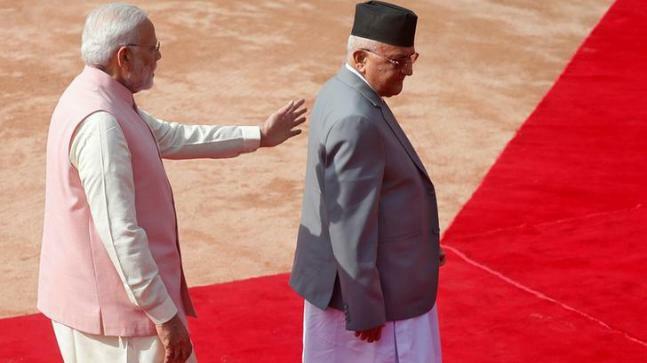 India is also miffed with the Nepal government for putting forth a weak argument that internal political pressure has compelled Oli to take the call. Although no official statement has been issued from the Indian side, going by the media reports it is more than obvious that the move was not appreciated by India. In Nepal, the Pune event was looked upon with much suspicion even by influential members of the ruling party. They argued that no political or military agreement was made before deciding to participate in the exercise and that it was, thus, only part of military dealings among the armies with no formal agreements. Although the controversy started only after Modi made a statement in Kathmandu welcoming the armies to participate in the joint-exercise, the preparations have been going on since June. Army officials from all seven BIMSTEC member-states, including Nepal, engaged in a planning conference for the same. Some Nepali experts have termed this withdrawal a strategic blunder from Nepali side because of lack of communication between the various line ministries and the Nepal Army. In addition, Oli had earlier defended the event in the parliament on September 5 when he ascertained that the Pune event was a regional cooperation mechanism and not a move towards military alliance. Sources in Kathmandu have said that the newly appointed chief of Nepal Army General Purna Chandra Thapa will not participate in the Septmber 16 conclave of army chiefs of the grouping. On Monday, Manjeev Singh Puri, the Indian Ambassador to Nepal, met Thapa and conveyed India’s unhappiness over the decision, sources claimed. However, it is important for India to note the context in which this decision has been made. Rather than blaming Oli government entirely, India may consider following factors in its bilateral relation with Nepal. It should be noted that Nepal has recently come out of an “unofficial blockade” during the Tarai movement and that which has seen a nationalist force coming to power on a strong anti-India platform. India has started engaging the Oli government only recently. Modi visited Nepal twice after Oli became the Prime Minister and has carefully restrained from making political statements relying, instead, on cultural and religious diplomacy. In May, he visited Janakpur and Mukhtinath temple—both important religious destination—and spoke of the people-to-people relations between the two countries while inaugurating the Ramayan circuit. There is a deep anti-India sentiment in Nepal which runs from the hills to the plains. It is on the basis of this resentment that Oli emerged on national political scene. India needs to address this through strong political and diplomatic overtures. The decision came at the heels of former PM of Nepal and Maoist supremo Pushpa Kamal Dahal Prachanda’s India visit. This visit may not have been particularly to Oli’s liking. Although Prachanda’s Maoist party and Oli’s CPN-UML have now merged to form a larger communist party, much needs to be settled between the two influential leaders. Prachanda’s visit was interpreted in Kathmandu as a show of his own strength and a move to seek India’s support in maintaining the power balance. Oli would not prefer Indian influence in structuring an equation between him and Prachanda. The latter is believed to be Oli’s successor. In order to not miff Oli, the MEA decided not to ask its ambassador in Nepal to accompany Prachanda to Delhi although the former PM was on an official government of India visit. However, it could have hardly pacified Oli. The Oli government has maintained that its foreign policy will revolve around respect for each other’s sovereignty and territorial integrity and non-interference in domestic affairs. India has to define its Nepal policy (which is non-existent today) as per the domestic situation in Nepal by respecting the popular mandate. Another over-arching factor is Nepal’s growing closeness with China. Oli government has finalized the much-awaited protocol of Nepal-China Transit and Transportation Agreement that will allow Nepal to use Chinese ports for third-country trade, thereby ending decades of Nepal’s dependency on India for trade. PM Oli had signed this agreement with Beijing during his China visit in 2016 which came after the border blockade. As per the meeting held last week, China will grant access to Nepal to its four seaports and three dry ports for trading. Nepal has already signed OBOR in May 2017, which has given China the right opportunity to expand its engagements with Nepal beyond the already existing state-to-state, party-to-party, and institution-to-institution levels. It is important to note that BIMSTEC track II before the fourth summit in Kathmandu had stated the need to bring China in to the regional grouping as in SAARC where China enjoys an observer status. Needless to say, China would not appreciate such a joint exercise led by India and that too just days before China-Nepal military drill kicks off. Nepal and China will participate in the annual joint military exercise named Sagarmatha Friendship 2 from September 17 to 28 in Chengdu with focus on counter-terrorism operations. Does BIMSTEC Really Need A Military Drill? One could question the rationale behind the BIMSTEC joint military exercise itself. Although BIMSTEC is a regional forum for financial and technical support for member countries, it is not to say that the grouping does not have security concerns. But if it is targeted against some states and is a show of strength, then smaller countries will be cautious. It will pose challenges and can have far-reaching implications for a country like Nepal. In addition, BIMSTEC has been a weak institution, both due to lack of resources (financial and manpower) and commitment. India should first strengthen the grouping by focusing on its core objectives. Otherwise even other regional groupings can opt for similar military exercise. Can SAARC, for instance, show similar military solidarity? No country can opt for a one-sided diplomatic policy.